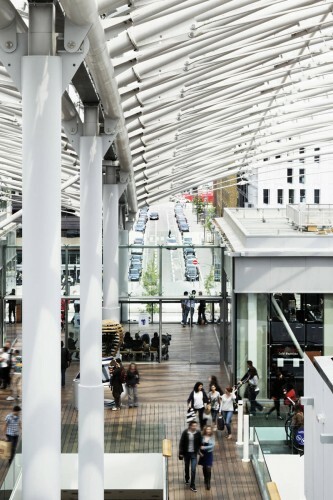 Jean-Paul Viguier conceived the project with a brief that extends beyond the 'classic' commercial centre in order to create a focal point for the city, up till now absent from this area of Lyon. 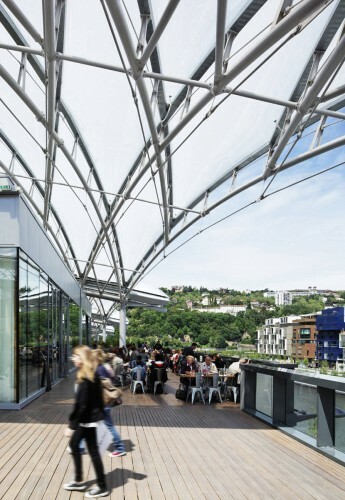 Located on the edge of a basin linked to the river Saone, the building is immediately noticeable by its transparent roof, made up of cushions of air in ETFE polymer, which unify the site and create a recognisable feature for the project. The four levels of the building are juxtaposed together under this light-weight cover. The impressive multiplex on the East façade overlooks the Cours Charlemagne and indicates the main entrance to the commercial centre. An ultra-slim transparent cover (a semi crystalline polymer which allows natural daylight to enter) offers transparency during the day and omits colourful waves of light at night. The incorporation of the existing railway line and the addition of a new landscaped basin linking the river Soane to the project, emphasises the complexity and poetry of the project. 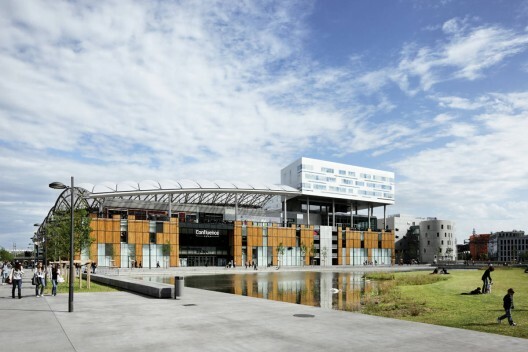 The Lyon Confluence Novotel Hotel fits into the overall development of the Commercial and Leisure Centre, situated in the heart of the 'Lyon Confluence' urban development. The floating volume of the hotel is organised on an L-shaped plan, integrated with the rest of the project, where each activity is clearly distinguished. The multiplex is located on the main East façade along the Cours Charlemagne and signals the development to the city. 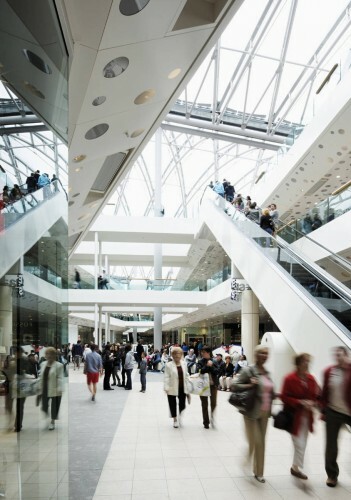 It takes up the first two bays of the Leisure and Commercial Centre and is 'superimposed' on the commercial spaces. There are 14 screens with a total of 3480 seats. The entrance is situated on level 2. The hall, on level 2, is largely glazed and overlooks the shopping mall and the Cours Charlemagne.